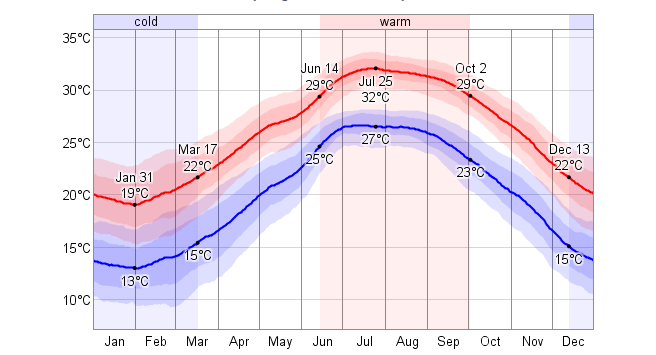 The picture above shows daily average high (red line) and low (blue line) temperatures. This climate map shows that the weather in Okinawa Japan is mild and sunny all year round. With that being said we can look at how the climate changes and what the best time is to visit the island for sun, sea and diving. Since Okinawa is located on a latitude of 36° 00′ Northern degrees, which makes it a sub-tropical location. This benefits the weather all year around and provides lots of sun every day. The temperature isn’t really changing all year around since the seasons don’t have as many impact as in the rest of Japan. Okinawa experiences average temperatures of 15-20 degrees in the winter months from November-December and 25-30 degrees in the other months. The hottest month is definitely July and August, the temperature rises above the 30 degrees on most of the days. Therefore, Japan has divided the seasons of Okinawa in warm and cold season. The warm season starts on June 14th and ends on October 2nd with an average temperature above 29°C. The hottest day of the year is July 25, with an average temperature of 32°C. The cold season starts on December 13th to March 17th with an average temperature below 22°C. The coldest day of the year is February 2, with an average of 13°C and high of 19°C. If you like sun, warmth and more sun then you should visit in July and August. But when you do like sun but want to do some activities such as sightseeing or tracking through the jungle we suggest you visit the island around April-June and September-October. In these months the temperature is perfect for the beach but the days are also perfect for sightseeing.